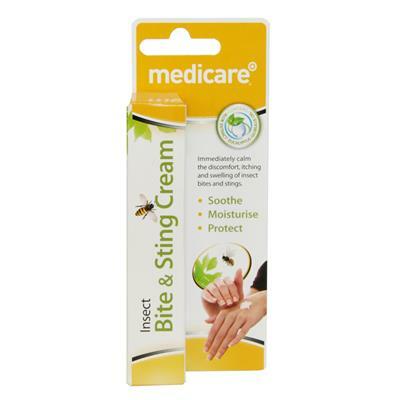 Medicare insect bite and sting cream provides instant itch relief for skin irritation caused by insect bites and stings. The specially formulated blend of soothing ingredients acts fast when you need it most. Soothing Aloe Vera and the breakthrough ingredient, Eucalyptus Globules Essential Oil, work together to soothe the skin, reduce irritation and fight the painful stinging and itching caused by an insect bite or sting. Don’t let insect bites and stings ruin your holiday fun! The compact tube is ideal for travel and it’s under 100ml’s, so there’s no need to check it in at the airport; you can carry it on board the flight. It’s also ideal for storage in a first aid kit at home, in the car or in an office first aid box, for those unexpected insect attacks. Seek medical advice if the area of the sting or bite swells up of if there is any difficulty breathing, dizziness, nausea, or other signs of severe allergy.